Weather, for many, can make or break any outdoor activity. However, there are diehard fishermen who, despite a persistent downpour, will head to their favorite honey-hole in hopes of limiting out on fish. Not only does the rain offer some new fishing opportunities and options, but it keeps the fair-weather anglers indoors, leaving the lake all to those who are willing to put up with a little bit of water, on the water. While rain isn’t life-threatening, it definitely isn’t fun to sit in soaking wet clothes while you’re fishing. To prevent this from happening to you, I’d suggest investing in a few waterproof clothing items. Bass Pro Shops’ Bone Dry line of heavy coats and pants are ideal for colder rainy days. Other than that, simple rain jacket is fine. 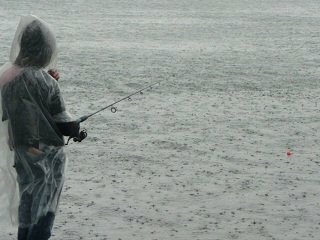 Frog Toggs are another product designed for rainy conditions on the water. The brand offers jackets and pants to keep you dry. You can find reliable rain jackets almost anywhere, and most come packaged in a small pouch. I would advise against ponchos, however, as they become more of an annoyance than anything once the wind picks up at all. Now when it comes to what lures to throw when the rain is pouring down, the general rule seems to be “any color works, as long as it’s black.” I’ve found though that darker color patterns, in general, will work just fine in the rain. Green pumpkin, watermelon, and black with accents of blue are good choices. Bass have difficulty seeing lures when the rain falls, so a darker color will stand out more and create a nice silhouette for them to target. Experiment with combinations, but I’d suggest always keeping a small collection of black and blue combinations for, no pun intended, a rainy day, such as a black craw with blue pincers. Rainy weather, especially consistent or heavy rain, will have numerous effects on the water in a lake. When there’s enough rain to raise water levels significantly, the fish will relocate. All that shoreline vegetation that was once in a mere foot or so of water will attract fish should the level rise another foot or two. Be sure to change the depth of your lures when this happens, as well. Water clarity can change quickly when it rains, especially in smaller lakes that connect to river systems. Fish the lower end of the lake to take advantage of water that may not be so muddy yet, and focus on rivers on that end. In such muddy water conditions that accompany rain, you can leave your finesse lures in the tackle box and switch to baits that kick up water and make a lot of noise. You can also try adding scent to your baits for a little extra enticement. Remember that you should cover a lot of water to locate the fish, rather than set up shop with a particular presentation. While the rain tends to keep many outdoorsmen indoors, there are those of us who will bravely bold anything from a drizzle to a moderate downpour in hopes of filling the livewell. If you count yourself as one such angler, then the tips I’ve outlined will help make your rainy day on the water a little more comfortable and productive. The important thing is to stay dry, stay warm, and have fun!